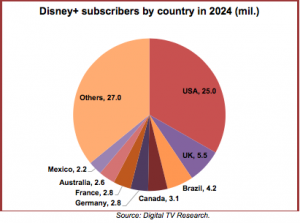 A forecast from research firm Digital TV Research predicts that Disney+ is set to reach as many as 75 million subscribers by 2024. On Thursday (11 April) Disney outlined its plans for its Disney + platform to investors and stated that it expects to reach 60-90m Disney + subscribers by 2024, with the US contributing a third. Digital TV Research believes that this is achievable but says that the US will remain the largest market by some distance, adding an average of 5m subs a year to take its total to 25m by 2024. The firm says that the UK will lag behind and provide 5.5m subs, followed by Brazil with 4.2m and Canada with 3.1m. It states that these four countries will account for half of total subscribers. By comparison, Netflix is expected to have 200m subscribers by 2024. Simon Murray, principal analyst at Digital TV Research, said: “The Disney brand is known and respected in every home across the world. Disney will deliver a reasonably-priced, attractive platform that has plenty of appealing content.